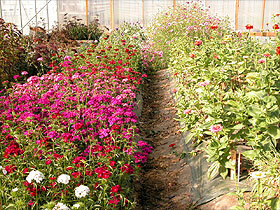 Growing flowers in beds uses space efficiently, and makes weed control and irrigation easier. See detailed crop profile pages for more specific information on timing, production techniques and varieties. Soil preparation can be done easily by a walk-behind rototiller. Once beds have been formed, they are easy to rebuild in the same place in following years. Adding compost to the soil in the tunnel adds organic matter, improves soil structure and contributes to soil fertility. Annual additions of about an inch of compost are beneficial. For weed control in the high tunnel, use black plastic mulch or landscape cloth. With the many cut flower species, it is rare to find a selective herbicide for specific flower crops. Test soil before your first season and every two years after that to ensure proper pH and sufficient levels of major and minor nutrient. In general, the absence of rainfall in the tunnel minimizes nitrogen loss. In conventional production (as opposed to organic), adding 50 lbs/A N should suffice for most flowers, especially in soil where you’ve added compost. Sidedressing with additional N using calcium nitrate in the irrigation system may be needed to boost late productivity. Don’t overfertilize. Excess N leads to weak stems and increased lodging, as well as increased susceptibility to plant diseases. Monitor soil pH annually and correct with lime if too acid, and by leaching of excess nutrients if too alkaline. The most effective method of keeping the crops in high tunnels well watered is by trickle irrigation. Generally, if flowers are grown on broad beds, trickle lines should be arranged so that they are adjacent to each crop row. Placement of the irrigation lines is generally just under the plastic mulch. Use the irrigation lines to distribute soluble fertilizer during the season as needed. Weekly irrigation is usually enough, and twice weekly watering is sometimes needed during the hottest times. 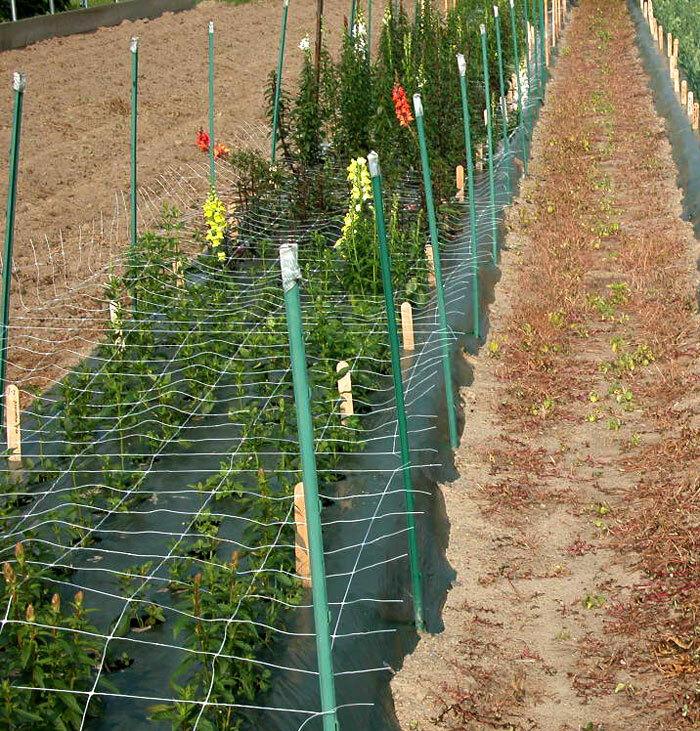 Horizontal trellis helps suppor plants. Stretch one or more layers horizontally at transplanting. Use the grid as a planting guide. 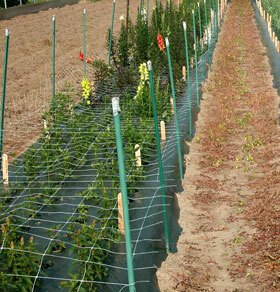 As plants grow, elevate netting and hold in place by stretching between upright posts. For climbing crops such as sweet peas, stretching netting vertically between tall posts is a good option. A top wire may be needed to provide additional support. Large doors provide ventilation and easy equipment access. 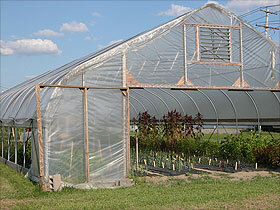 See Structures section for more detailed information high tunnel construction and features. Tunnel should be tall enough so that twice-weekly harvesting can be done comfortably. End doors should be large enough to allow entry for rototillers and small-scale machinery, but need not be so wide that large tractors can gain access. If tunnel is used to grow tulips for early spring, or direct-seeded larkspur sown in the fall, it should be sturdy enough to endure snow loads. High tunnels can be very useful for extending your growing and marketing season in fall. If protected from an early fall frost, flowers planted for fall harvest can make good growth in the following warm, sunny weather. Given consumer preference for fall colors, make sure to choose varieties with orange and red flowers for this season.